You asked for a vessel with a name like "DUKE STIR". That selection resulted in 1 matches. There's an interesting article by the North County Times by William Finn Bennett (6/27/2005) on the fair market rent for Duke-Stir. The fair rent would be $600/month, in addition to the usual docking fees and maintenance. 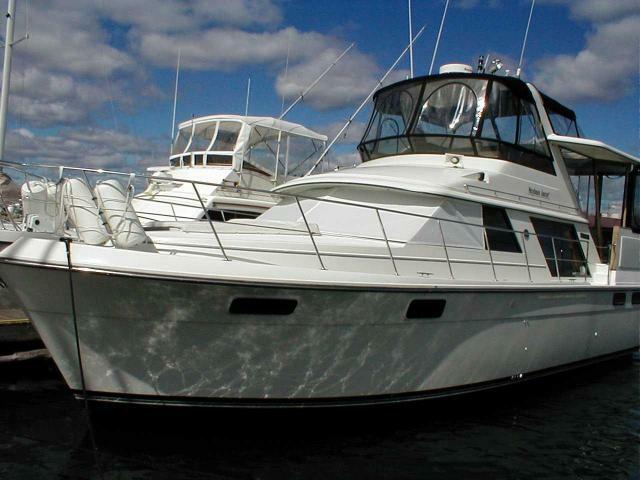 Beyond the Duke-Stir's, "$600/month, in addition to the usual docking fees and maintenance," I wonder about his 65ft. yacht, the Kelly C.
How much is it costing, and who is paying for the reported Kelly C. "refurbishing" while he lives aboard the Duke-Stir? Yachts are expensive enough without having to pay for two at the same time. After Wade bought the boat and the Duke started using it, around April 2004 (to Duke's statement of 6/23/2005), the Duke got razzed about the gay-themed boat name at the Capitol Yacht Club, so he changed the name to the Duke-Stir. The previous owner of the Duke-Stir (the yacht Mitchell Wade bought for Cunningham to live on), was Scott Schramm. He also was the founder of the "Potomac Rainbow Cruisers." They are a group of gay and lesbian power boaters, located in the same Capital Yacht Marina as the Duke-Stir � formally named "Buoy Toy" — is now berthed.